Choose the option that works best for you. We look forward to turning your artwork into a beautiful product. For all home décor products (including calendars, notecards and posters) download our Art Submission Form and ship your artwork to the address on the form. 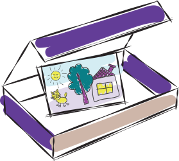 Email your image to orders@plumprint.com with the product/s you'd like to order in the subject line. If it's high enough resolution, we'll prompt you via email to complete your order. Have a big pile of artwork you'd like in a book or digital gallery? Start your order here. Once we receive your artwork, we'll prompt you via email to complete your order. 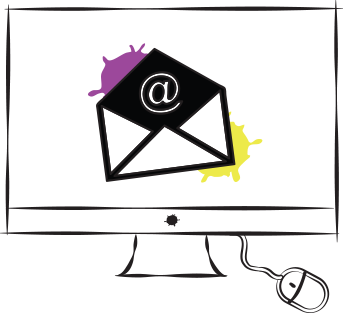 Please add orders@plumprint.com to your address book so our emails don't accidentally get sent to your spam folder. Why do I have to send my artwork? We prefer to have you send in your artwork so our professional digitizing studio can capture the best possible digital reproduction of your artwork. But if you’re pressed for time, or you’d prefer to do the digitizing yourself, feel free! Just follow the directions here to send us your image(s). How do I know if my image is high resolution? You can check the dimensions and size of an image by looking at the “info” about your image (often by right-clicking the image). Make sure the image is at least 1000 x 1000. Feel free to email us your image and we can check it for you! Tip: When sending us your image, make sure to click “Actual Size” when your phone and/or email system gives you a choice as to image size. Can I send different pieces for different orders or different products? Yes! Mail us the pieces that you would like to use on the products. Once the artwork is digitized, we’ll send you a link to your gallery, where you can pick and choose which pieces are printed on each product you’d like to order. There is a 6 business-day turnaround. Our new products are shipped out on the 4th business day after you place your order. Products are shipped via USPS Priority 2-day mail. We currently only ship products to the US and Canada. There are, however, extra shipping fees for shipping outside of the Continental US. Don't see your question here? Email us and we'll respond within one business day.